The thing about living in California is that it's still 94 degrees at 6 p.m. in the evening and my scarves haven't seen the light of day since January 2010. 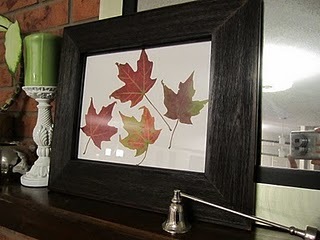 So when October is knocking on my door and I want to decorate with fall leaves, my only option is the fake variety. I found this inspiration today on Craft Gossip by craftyland. Once the leaves in my front yard change to any color besides bright green, these instructions are great. But in the meantime, I plucked a few leaves from last week's fall wreath. I literally just walked around the house and grabbed what wasn't being used for this project. No money has been spent!